"As a programmer on CHLY FM I've had the opportunity to build a good size collection of music over the years. 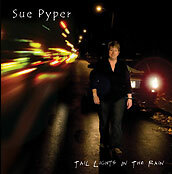 Sue Pyper's new CD "Tail Lights in the Rain" is one that will undoubtedly end up in my favorites folder. The arrangements, performances and production here are nothing less than stellar. Overall Sue has put together a cohesive collection of very strong, well crafted original contemporary flavoured folk tunes and added a couple of complementing covers that will be heard and enjoyed around the world." 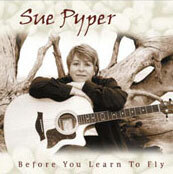 Sue's debut CD "Before You Learn To Fly", released in 2003, was very well received by listeners and reviewers and recieved considerable air play including live performances on CBC. The title track earned her a "Best Song" Award at the 2003 Vancouver Island Music Awards. Her latest CD "Tail Lights In The Rain" was released January 2009.